One of the larger hawkfish, they usually come in around 6 inches or so. 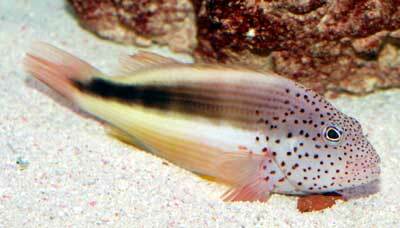 Like other hawkfish, they will sit on rocks and corals looking for food. Unlike other hawkfish, they’re much more active and will eat invertebrates and fish, and because of this you will need to be careful when placing it in a reef tank. The Freckled Hawkfish is a good fish for an FO or FOWLR tank.